How Do Beavers Engineer Better Fish Habitat? An ecological experiment that employed beavers to restore streams in Central Oregon found that the streams produced nearly twice as many juvenile steelhead within a few years after the beavers went to work. While beavers’ natural engineering abilities are well-known, the project on Oregon’s Bridge Creek is the first to show that their reengineering of streams can yield such pronounced improvements in fish populations. The results suggest that, under the right conditions, beavers can restore the health of streams and their fish, faster and likely at lower cost than traditional river restoration that relies on expensive heavy equipment. The results of the research on Bridge Creek, a tributary of the John Day River, were published in Nature’s online journal Scientific Reports by a team of scientists from Eco Logical Research Inc., Utah State University, NOAA Fisheries, the Oregon Department of Fish and Wildlife and South Fork Research. The research was funded by the Bonneville Power Administration and NOAA Fisheries. Large numbers of beavers once coexisted with salmon and steelhead across the Northwest until they were trapped nearly to extinction in many areas. Streams such as Bridge Creek also deteriorated under pressure from grazing and other activities. Many streams became incised, cutting trench-like into the ground. The falling water table left streamside vegetation stranded on high terraces, where its roots could no longer access water. Such streams provide poor fish habitat. Beavers also struggled because a lack of large wood left them to construct dams with small willows easily washed out by high flows. In 2009 scientists tested what would happen if beavers got a foothold. The scientists jump-started the beavers’ work by sinking posts (called beaver-dam analogs, or BDAs) into the streambed of Bridge Creek to help the animals build and anchor their dams against the current. In addition, the Bureau of Land Management reduced grazing in wetland areas along the creek, and the Oregon Department of Fish and Wildlife closed the watershed to beaver trapping. Quickly, beavers began building dams using the BDAs throughout Bridge Creek. By 2013 beavers had built 171 dams with help from the BDAs or naturally, eight times more dams than the average of the few years before scientists installed the BDAs. But the real change was in the stream. Beaver dams anchored to the BDAs raised the water level, creating large pools where sediment was deposited. Soon the trenches began filling in, and water spread out onto the adjacent floodplain, giving rise to streamside vegetation and creating side channels and backwaters. Water temperatures slightly cooled in stretches with beaver dams compared to those without. The changes improved fish habitat, with a deeper more complex stream channel. Over seven years the scientists tagged 35,867 fish with tiny electronic tags to track their movements and survival. They found that beaver ponds held more juvenile steelhead than adjacent upstream areas. Plus, the ponds created more wetland habitat. Overall in Bridge Creek fish density increased and juvenile steelhead survival jumped 52 percent compared to a control watershed where scientists had not installed BDAs. Only four years after scientists first installed the first BDAs in Bridge Creek, they recorded a 175 percent increase in juvenile steelhead production compared to the control watershed. While the quality of habitat improved, the quantity of habitat also increased as stream channels and wetlands expanded into the floodplain, Jordan said. “Because of the large scale nature of the experiment and the intense monitoring, this study represents one of the few examples of detecting benefits of restoration to a fish population- and perhaps the first to show beavers as the restoration agent to cause such a response,” Bouwes said. More ambitious efforts to use beavers as agents of restoration are now underway in other parts of the Columbia Basin. An interagency team of scientists has also developed the Beaver Restoration Guidebook to assist landowners and others interested in recruiting beavers as natural engineers. This entry was posted in Conservation, Trout and Salmon on August 26, 2016 by ronniegarrison. Last weekend ten members of the Potato Creek Bassmasters fished our August tournament at Lake Guntersville. In two days and 16.5 hours of casting 27 bass longer than the 15 inch minimum size weighing about 60 pounds were weighed in. There was one five-fish limit and three people did not catch a keeper either day. Ryan Edge had eight keepers weighing 18.89 pounds for first, Raymond English caught nine weighing 18.33 pounds for second, my three weighing 8.04 pounds placed third and my 4.76 pound largemouth was big fish. James Beasley was fourth with three weighing 5.63 pounds. Guntersville is legendary for its big bass and numbers of them. But as our trip showed, it is less well known that it is the hardest lake in Alabama to catch a keeper in a club tournament. Some people get on the fish and do real good, others struggle. I went over Thursday afternoon and got a campsite at Guntersville State Park, a great place to stay. The next morning Kwong Yu met me at the ramp to go fishing. He was staying in a cabin with some other club members. We both caught a keeper bass in one of the places we fished before noon. At 1:00 we went back in a big bay full of hydrilla. When I stopped the boat there was about a foot of water over the grass bed that ran from a foot deep to the bottom in eight feet of water. I picked up a frog and quickly caught an 18 inch keeper, then cast a big Whopper Flopper topwater plug for a few minutes and caught another one that size. That got me excited, I just knew I could catch fish there during the tournament. We started there at daylight the next morning and never got a bite. We fished it two more times that day without catching a fish. In fact, with one hour left to fish neither Kwong or I had a keeper bass. I caught a very skinny 18 inch bass on a jig and pig by a tree on a steep bank for my only keeper of the day. Sunday I got the big one and one other small keeper on a jig and pig out of a grass bed. We never got a fish out of that bay either day. This entry was posted in Bass Fishing, Tournament Fishing on August 25, 2016 by ronniegarrison. What Would An Australian Gun Law Do To Me? My daddy always said “Never elect an honest man, holding an office will just make him a crook.” I guess that influenced me a lot. I often think that anyone wanting to run for office should be automatically disqualified. Why would anyone want to hold an elected office where every voter expects something in payment for their vote, and no matter what you do you are going to have about half the people mad at you all the time. I am a one issue voter. I will never vote for anyone wanting to pass laws to restrict my 2nd Amendment rights. I have owned guns since I was six years old and got my first BB gun. My guns have provided me untold hours of fun shooting targets, have provided me food all my life and have given me the comfort of knowing I can take care of myself. None of my guns have ever harmed another person, and they never will unless used to protect myself or someone else. So how does restricting my rights make a difference? If laws kept illegal things out of criminals’ hands, we would have no cocaine or heroin on our streets. The election this year is a problem. Donald Trump has never been a gun rights person until recently. He says he has changed. Hillary Clinton has been anti-gun all her life. So do I vote for Trump and hope he does what he says about guns, or vote for Hillary and hope she does not do what she says she wants to do. To do that I would have to ignore everything else. Recently Hillary said she wanted the same kinds of laws in the US that were passed in Australia. There, after a mass shooting in 1996, the government confiscated all semiautomatic rifles, pump and semiautomatic shotguns and almost all pistols. They said they would pay you if you turned in your banned gun by a certain time but after that they would just take it. In 1988 25 percent of households in Australia had a gun, by 2005 only six percent had one. That is what Hillary wants for us. Has it made a difference? The murder rate there dropped from 1.9 per 100,000 in 1993 to 1.3 in 2007, a tiny drop of six tenths of one percent. And it has not been a steady drop, in 2002 they had the highest number of murders there in 26 years. But in Australia, just like here, the murder rate had been dropping for years before they confiscated guns. Some gun banners argue that confiscating guns will reduce mass shootings, like it did in Australia. But in this study – http://www.cjcj.org/uploads/cjcj/documents/Mass_shootings.pdf – the authors found there were so few mass shootings before gun confiscation that no before-and-after study could be done. They did compare New Zealand and Australia, two similar countries with very different gun laws, and found no difference because of the law. So, because of one mass shooting, a country confiscated over 600,000 guns, a high percentage of all guns in the country, and it has had no effect. If Hillary got her way, the government would confiscate almost all my guns. Four they would take would be the Winchester Model 1893 pump 12 gauge my father inherited from his father and passed on to me, the Ithaca pump goose gun my father-in-law gave to me, the Browning semiautomatic long barreled 12 gauge my daddy shot doves with all his life and the Remington short barreled semiautomatic 12 gauge he shot quail with before passing them on to me. The government taking those guns away from me would really help with crime. I will never support anyone wanting to follow Australia’s gun ban and confiscation law. This entry was posted in Guns and Gun Control on August 23, 2016 by ronniegarrison. Why Is There A Complete Closure of Yellowstone River? An unprecedented fish kill has brought complete closure of miles of one of America’s greatest cold water fisheries. This entry was posted in Conservation, Trout and Salmon on August 22, 2016 by ronniegarrison. On Wednesday I met Frank Lillig at Lake Allatoona to get information for the September Georgia Outdoor News Map of the Month article. Frank is president of the Kennesaw College Bass Team and also Assistant Director of the ABA Division 125 Tournament trail that fishes Allatoona and Carters Lake. Like many of the other college and high school fishermen I have done article with, I was impressed with his knowledge of bass fishing. And we had a cool rainy day! 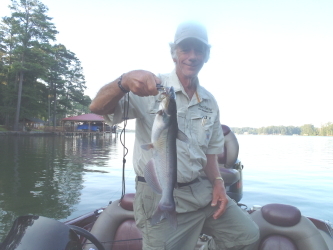 Unfortunately, the spotted bass at Allatoona didn’t respond to the nice weather. For years Allatoona was known as the Dead Sea since fishing was so tough there. But a few years ago it started showing up on the Georgia Bass Chapter Federation Creek Census Report as the lake in Georgia where it took the least amount of time to catch a keeper bass in a club tournament. I would like to fish Allatoona more often but traffic is ridiculous going and coming from the lake. The most direct way to get there is straight up I-75 through down town Atlanta. Pulling a boat north at 5:00 AM is not bad. Pulling it south in mid-afternoon is a nightmare! This entry was posted in Bass Fishing on August 19, 2016 by ronniegarrison. August Clarks Hill Bass Tournament – Weather Hot, Fishing Not! I think the doctor took out what little skill I had in catching bass when he did my neck surgery! After missing all three club tournaments in June I fished three in July and one last weekend. The results have not been pretty for me. Last weekend the Flint River Bass Club fished our August tournament at Clarks Hill. We have fished there the past two years the same weekend and I have finished third both times so I felt pretty good about three places I could catch fish. I usually go over there on Wednesday to practice but this year since my collar is so hot and I was so miserable at Weiss I decided to wait until Friday night and fish the tournament without any practice. That hurt. The idea of practice is to check places you think you can catch fish to see if you can, and if you can’t to make adjustments and find places you can catch them. Without practice I had to try to do that during the tournament and, no surprise, it didn’t work! I started on a bridge where I have caught fish in the past and Wes DeLay, my partners, quickly caught a keeper. About 30 minutes later I caught a keeper on a topwater plug. That was it for the bridge and I was disappointed I saw no baitfish around it on my depthfinders. That is a bad sign. Last year I found an old house foundation in 20 feet of water and there was a school of two pound bass on it. I caught four there last year but this year the only thing I caught was a big warmouth. Wes did get his second keeper there. The lake was down 5 feet and that may have been why the fish were not there this year. We made a run longer than I wanted to with my neck brace but had to try the back of a creek where I caught bass last year around the hydrilla. I was shocked when we got back in the creek and there was almost no hydrilla there. It just did not grow this year for some reason. By then it was very hot and I had told Wes we would probably spent a lot of time under bridges in the shade. Last year I caught a few fish under the bridges in Soap Creek but this year, although we fished under them for about four hours, we never caught a fish. Very frustrating but at least I was not miserably hot. For the day Wes had two and I had one to weigh in. Sunday I quickly caught a keeper on a spinnerbait off the same bridge Wes caught one the day before. That was it. Although we tried the house foundation with no bites then ran to the main river bridge and fished it, neither of us caught another keeper the rest of the day. I was shocked when we got to the big bridge and saw current running under it from the pumpback at Lake Russell. When current moves like that it usually makes bass bite. I told Wes I would normally bed $100 I could catch at least one keeper off the pilings but was afraid to this year. Good decision. Although we fished every piling all the way across the bridge using a variety of baits I caught one small spotted bass. That was the only bite. Neither of us caught another keeper! In the tournament 12 member landed 46 bass weighing about 87 pounds in the 18 hours we fished. There were two five-fish limits and one person did not catch a keeper either day. Chuck Croft won with nine bass weighing 16.35 pounds, Niles Murray was second with seven weighing 12.49 pounds, John Smith had six weighing 11.20 for third and Travis Weatherly had fourth with three bass weighing 10.43 pounds and big fish with a 6.47 pound largemouth. It was interesting. With the water temperature at 88 degrees on the main lake and 93 back in the creeks, three bass weighing over five pounds each were landed. At least two of them came in shallow water and I heard on buzzbaits. The first day Phil King had a five pounder and just one other bass. The second day, after catching a limit weighing 6.41 pounds the first day, John Smith had one bass the second day weighing right at five pounds. And Travis had two keepers on day one and only one on Sunday, the 6.41 pounder. So it looked like they made a lot of casts for that one big bite. Of course, I made just as many casts and never got that big bite! This entry was posted in Bass Fishing, Tournament Fishing on August 16, 2016 by ronniegarrison. Last weekend the Sportsman Club held our July tournament at Lake Weiss. I’m not real sure why we set up a two day tournament this time of year when it is miserably hot but I think it was because someone in the club heard the fishing was hot at Lake Weiss last January when the schedule was set. The fishing was not hot but the weather surely was! I had one of those weekends when everything I did seemed wrong. I camped in my van. That may sound stupid but I have a small window unit air conditioner I use. Friday night I set it up in the passengers window and turned it on. The collar I have to wear kept me from twisting around to see the controls very well but when it came on it was blowing cool air. All night I was too warm to be comfortable but not miserable. Even so, I didn’t sleep very well. The next morning when unhooking it I was able to see the controls and realized I had left it on the lowest setting. Pretty stupid of me. Saturday night I set it on its highest setting and had to turn it back down some after just an hour or so, it was very cold in the van! We started fishing at 6:00 AM Saturday and I ran to a bridge and threw a topwater bait for an hour without a bite. That worried me but I was not too surprised since the water temperature was 88 degrees. I knew I should be down on the main lake fishing deeper ledges that some good fishermen had shown me for past articles, but I didn’t want to take a chance on making a long, bumpy ride from the boat wakes. I was afraid my neck would not be happy even with the brace. At 7:00 I started fishing a line of docks where I have caught some fish before and at 7:30 I got a bite on a jig and pig beside a seawall and landed a bass that barely touched the 12 inch line. I put it in the live well but was worried. The tournament director for BASS calls those lengths of bass “line burners” since they are so close. To be legal in a tournament the bass must measure 12 inches in length. We all carry measuring boards marked off in tenths of inches. One end is “L” shaped so you can put the mouth of the bass against it and see where the tip of the tail measures. The mouth must be closed. I don’t want to be embarrassed by a short fish at weigh-in so I push the bass tight against the upright while checking on the lake. When I am measuring fish as tournament director I do like all the others, I just make the tip of the lip touch the upright and do not put pressure on it. The pressure will make the bass measure about one-eight inch shorter so checking it that way on the lake guarantees it will be legal. At 8:00 I cast my jig and pig to a seawall where I could see the bottom. It was less than a foot deep but something thumped my bait. I set the hook but nothing was there so I assumed it was a bream, but I threw back to the same spot and bait and line started moving out from the bank. I set the hook again and this time landed a two pound bass. About an hour later I cast to another seawall in less than two feet of water and landed another two pound bass. Then I got a 12 inch keeper from under the next dock. This one went a tiny amount over the line on my board even with pressure on its mouth. That was at 9:00. Up to that time there had been some hazy clouds and it was not too terribly hot. But by 10:00 the sun was burning down and there was no breeze. Since this collar I wear is fiberglass with foam rubber that covers from my chin to the middle of my chest and back of my skull to middle of my back it is a little warm. I got under a bridge in the shade and fished for about three hours without a bite, but at least I was in the shade! When some clouds rolled in at about 1:00 I tried some other spots but never caught another fish. At weigh-in my three weighing 5.3 pounds was third place. I decided to not take a chance on the line burner. Niles Murray was in second with three at 5.5 pounds and JR Proctor had a limit weighing 7 pounds for first. The next morning I fished from 6:00 to 10:00 without a bite. At ten I got under a bridge but as so disgusted I did something I have never done in 42 years of club fishing. I loaded my boat and came home three hours before the tournament was over! I heard JR won but did not get the rest of the results. A guy I know that fishes the lake a lot won a tournament there Saturday with five bass weighing 15.5 pounds, fishing ledges down the lake! This entry was posted in Bass Fishing, Tournament Fishing on August 2, 2016 by ronniegarrison. How Can I Keep Bass Alive in Summer? Largemouth bass anglers who practice catch-and-release fishing this summer can follow a few simple steps to ensure the fish they catch today will survive to bite another lure tomorrow. Summertime heat brings with it higher temperatures and lower dissolved oxygen levels in reservoirs and rivers — conditions that are tough on largemouth bass, which can become more stressed when caught. To minimize stress on fish, an angler who plans to catch and release the fish should land the fish quickly and handle it as little as possible. Use a knotless nylon or rubber-coated net instead of a knotted nylon net. Keeping livewell water about 5 degrees below the reservoir or river temperature by adding block ice. Waters also recommends that tournament participants fill their weigh-in bags with livewell water, not reservoir or river water, before putting in their catch. They should put only five fish in a bag, fewer if the fish exceed 4 pounds each. Finally, they should limit the amount of time that fish are held in bags to less than 2 minutes. Fishing tournament organizers can do their part to help keep fish alive by adopting best handling practices at all events. These include staggering weigh-in times to reduce the time fish are held in weigh-in bags, arranging for release boats to return bass quickly to the water and equipping recovery stations with oxygen and recirculating water. Organizers also can provide holding tanks during the weigh-in with water 5 degrees below the reservoir or river temperature and with oxygen levels above 5 ppm. They also can reduce the number of competitive fishing hours. An alternative to the traditional weigh-in tournament is to conduct a “paper tournament,” which doesn’t require a weigh-in. “This is an especially helpful strategy during periods of extreme heat,” Waters added. More information on keeping bass alive, including the B.A.S.S.-produced publication, “Keeping Bass Alive: A Guidebook for Tournament Bass Anglers and Organizers,” is available on the Commission’s website, www.ncwildlife.org/fishing. The Commission has produced a “Keeping Bass Alive” card, suitable for downloading and printing that provides tips for both recreational and tournament anglers. This entry was posted in Bass Fishing, Conservation, Tournament Fishing on August 1, 2016 by ronniegarrison.